YouTube is good to promote business. YouTube is video sharing website that have big traffic. Its traffic support by search engine Google and their recommendation. YouTube help all kind of business to get viewer, if the content that you create is match with what audience find and like. Therefore, every video have different amount of viewer. There is benefit of YouTube for business. YouTube help to host your video for a free. If you watch YouTube, they also give recommendation based on video that you watch, like, and your profile. So YouTube also recommend your video to audience that like similar one. Video on YouTube exhibit livelier and conviction narration for audience. Aphorism say, seeing is believing. If the amount of viewer is different for each video, how to get more viewer? Create video that people want. You can research keyword that most people input in YouTube. Fill information in your video. That is about description, keyword, tag, and also closed caption. Create many video with different keyword or topic. How to create video content for YouTube? Convert presentation to video. Power point 2010 can convert their presentation to video format. Another example is activePresenter. Software can help to create video. For example Sparkol Videoscribe, Sparkol Tame. What is topic that help to connect business with relevant segment market? Combination of hard selling and soft selling style is necessary. Hard selling mean, you sell your product openly. You ask them to buy your products. You tell them how to buy. Usually, people don’t like to be persuade to buy. But, if they need, it is no problem. Soft selling mean you talk about useful story or tips. Then you include your products in the story. YouTube give good presence because it shows motion picture and sound. 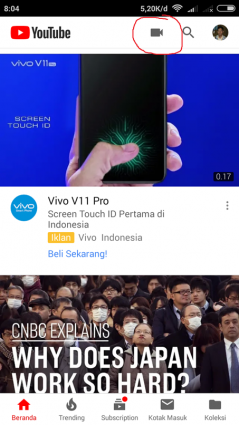 So you can show your products and how your service in YouTube. There is what you need to do to build brand in YouTube. Define your positioning. Your brand is build based on your positioning. You can show process how you serve your customer. Show it in YouTube. You can show positive reaction of another customer. That is testimony. You can show how your products are made. What your strict criteria to produce. Introduce your staff. How they relevant to produce good product and service. Test your product and show it in YouTube. What character that you want to show? Strength, give it villain that test its strength. Show your products in beautiful landscape. You can ask customer to give picture. Or if you go to abroad or far city, you can take a picture with the products inside. What tools that you need? You can use your android or iPhone with camera to shoot. The you can upload at YouTube application. Or, if you want to get better film, use camera. Shoot it. Then upload it to youtube using browser. If your file that you get from camera is very big, your can resize it. You can use format factory software. Search format factory software in search engine. That is free software and good functionality to resize film or picture. Another alternative is video maker. You can use video maker like sparkol video scribe. That is not free. Or you can use several video creator like biteable.com, spark.adobe.com. Be careful about using picture, film, and sound music from internet. Most of them have copyright that we cannot use it without permission. It is picture about button to upload video on YouTube.